I woke up yesterday to find Xander sleeping under (and on top of) five of my crochet blankets. He looked so peaceful in his merry nest that I just had to creep in and look at him. When I got closer, I saw that he had wrapped his four favourite stuffed animals in my Midnight Garden lapghan, and was clutching this parcel to his chest as if he would never let it go. When he woke up, we realised that he was feeling a bit under the weather, so that explained the excessive collection of hand-made items. He always surrounds himself with ‘comfort’ things when he isn’t feeling well. I will tell you more about Yarn 2 in a minute, but first I want to tell you about my journey with the Midnight Garden lapghan. 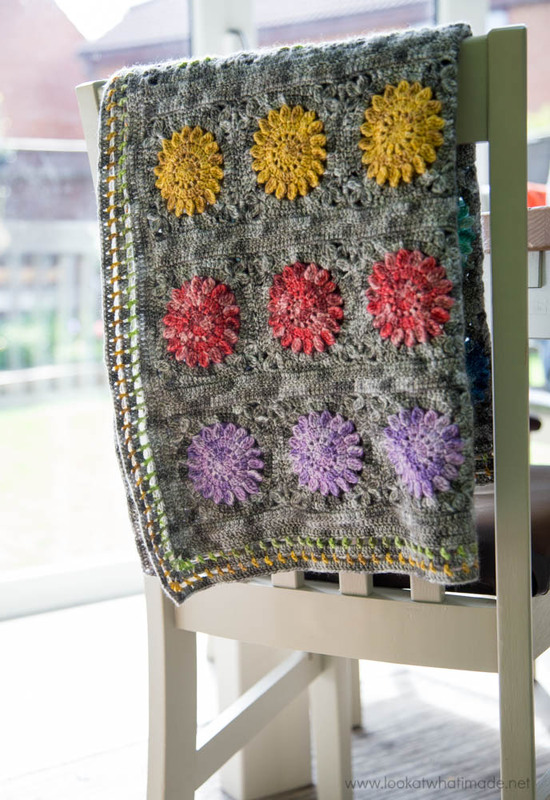 The lapghan is a teeny tiny 70 cm x 82 cm (27.5″ x 32″), but it can easily be adapted to create a larger blanket. I used a 4 mm hook and 4.5 mm hook. 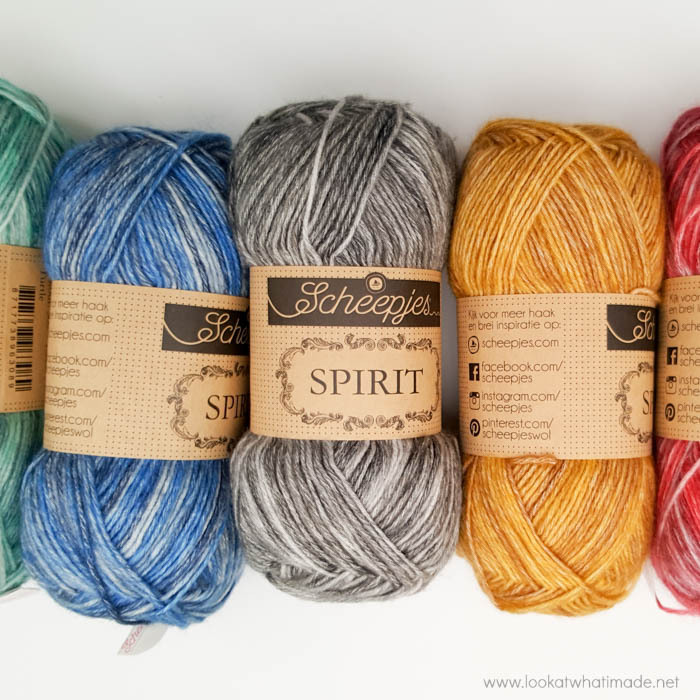 Scheepjes Spirit has a stonewashed, hand-dyed feel that I love. Below you can see the central ‘flowers’ in the six different contrasting colours. The splashes of lighter colour make me think of moonlight catching parts of the flowers and leaving other parts in shadows. The dark grey is my nod to the night. 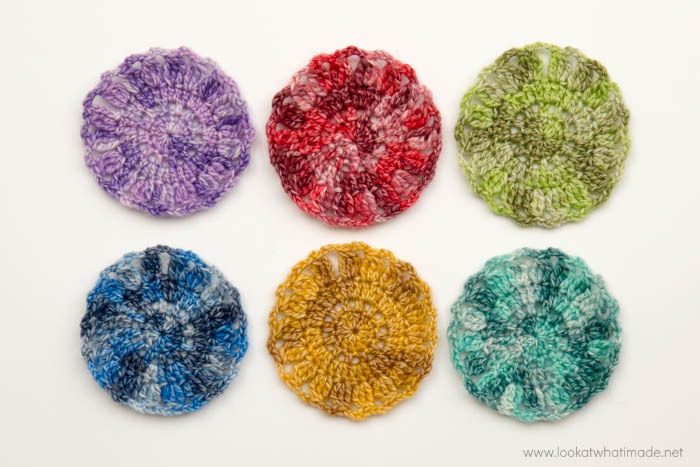 I’m quite curious to see what a Noon Garden colourway would look like and whether the same colour flowers would work against a light background. Right here is where I got sidetracked and started looking at colours instead of finishing this post. That led me to the following conclusion: I think that Lion (304), Blue Jay (306), Grasshopper (307), Flamingo (310), Dragonfly (312), and Salmon (313) would work for a Noon Garden, using Wolf (302) as a background. Eeps, now I feel like I should drop everything else and have a little play with those colours! But I must not. Otherwise, it will be another six weeks before I blog again! Yarn and colours are so distracting!! 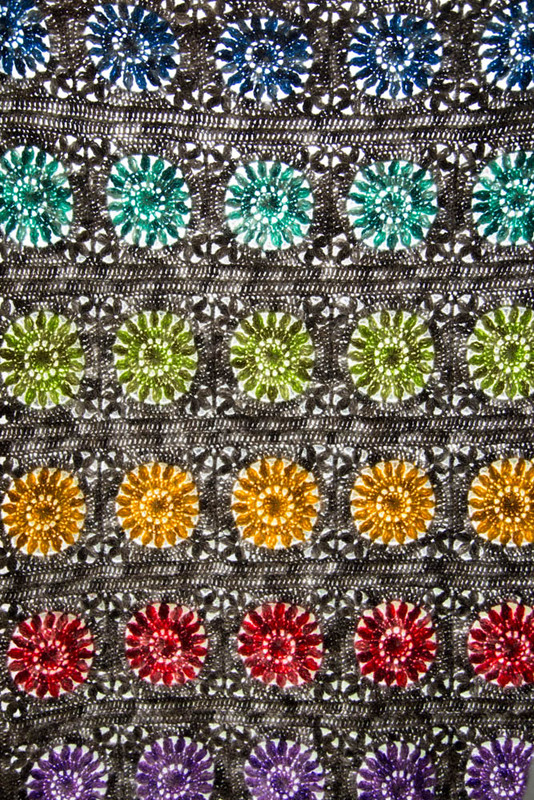 Unfortunately, his crochet repertoire has not extended past chains, double crochets, and slip stitches yet, so it was up to me to turn all the flowers into squares. Maybe I should say, fortunately, because who can complain about having to crochet more? I wish I could crochet all day! Once I finished all the squares, I attached them in strips (like scarves…there’s another idea which I MUST not let myself get sidetracked by right now). When I had joined all the strips to each other, I added a very simple border (which, I think, looks a little bit like a fence surrounding the garden). I will always remember making the border because I worked on it at our friends’ house in Milton Keynes, sitting in their HUGE braai room (barbeque room), at their gorgeous table, while the kids all ran around laughing and squealing. And here it is all done. My very own Midnight Garden! The dappled bits make me all kinds of happy. When I look at them, I want to pretend that Christiaan and I are strolling through an English garden at midnight. You know, like just about everyone does in Regency Romances. When I was still working on the blanket, I held it up to see if I liked the result. With the sun behind the blanket, it looked like a stained glass window, so of course, I had to share a picture of that with you too. It looks very lacy viewed against the light, but as you can see from the rest of the photos, the ‘fluffiness’ of the yarn fills the spaces between stitches nicely (unless you hang it in a window). Working on this blanket was a treat. 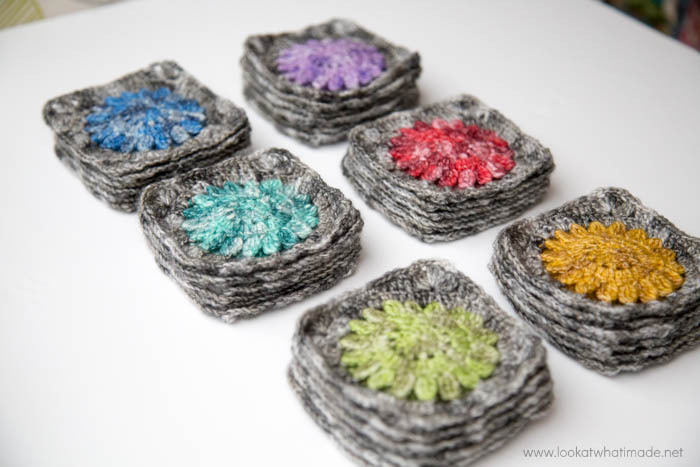 The little squares were perfect for doing on the tube to and from work (and even on my crochet/walking) outings. The pattern is also very easy to memorise. 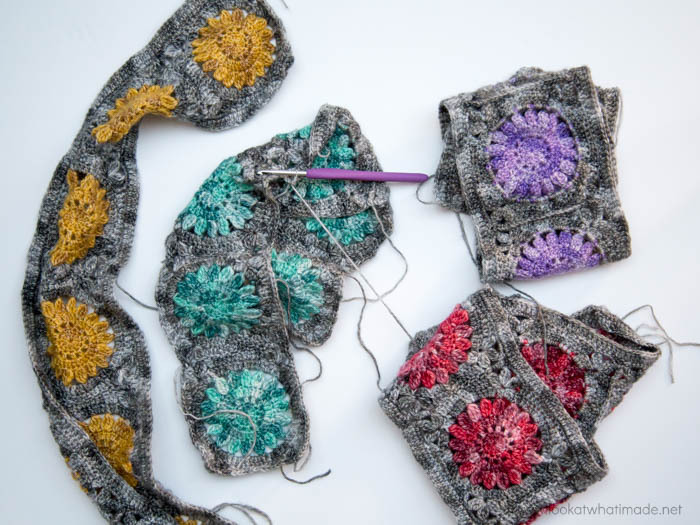 If you would like to ‘bookmark’ this pattern for later, you can add it to your Ravelry Queue. 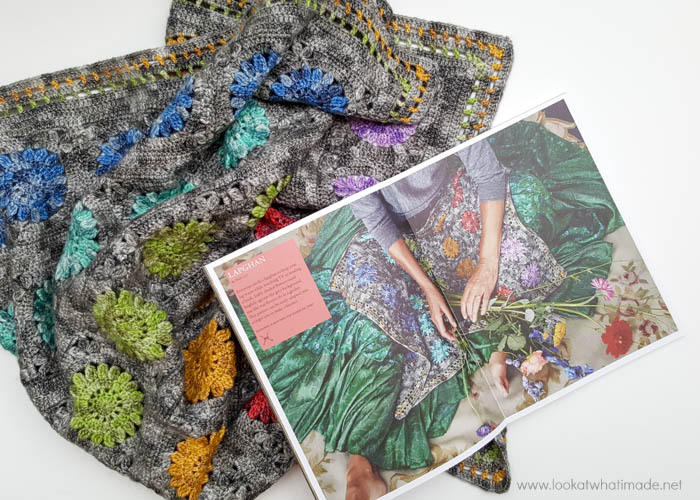 If you decide to make the blanket, please share photos using #midnightgardenlapghan so that I can see them. All the photos in Yarn 2 are amazing. It has a moody, rich feel, and the styling is stunning! I LOVE the photo they used for the Midnight Garden Lapghan. It is hard for me to put words to the feelings this photo evokes in me. I can tell you that I love the grace of the model, even though all you can see are her arms and bare feet (I’m always barefoot, so that appeals to me). I can also tell you that I want that skirt! The other photos are equally artistic and gorgeous. I wanted to step into some of the pages (especially the ones featuring Annelies Baes’ Gothic Cardigan), and I wanted to know the stories behind some of the others (like Sarah Knight’s Brioche Hat – pictured below). I wanted to be the lady wearing Jellina Verhoeff’s Peacock Shawl (she’s so graceful! ), and I wanted to know what the girl was thinking in the photo of Atty’s Flower Field Wrap. The pattern I am most likely to make is Tatsiana’s Moonlight Butterfly Blanket. 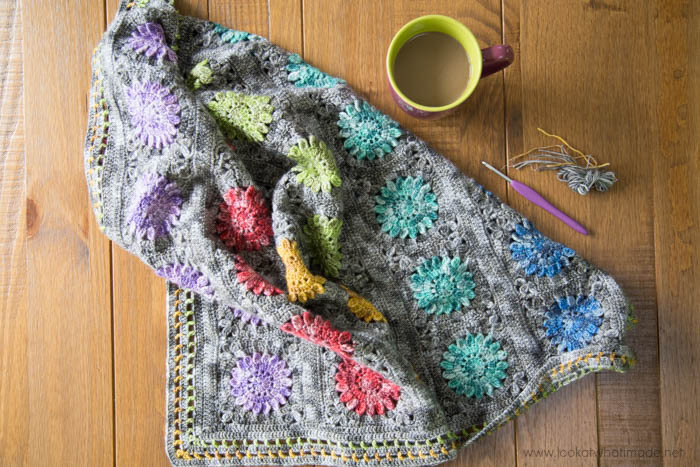 It is made up of cute butterfly motifs in a soothing colourway. You can see photos of it HERE on Tatsiana’s blog. While you are there, have a look at her latest patterns, which are each more beautiful than the last! If you want to see which other projects feature in Yarn 2, have a look HERE on Ravelry. 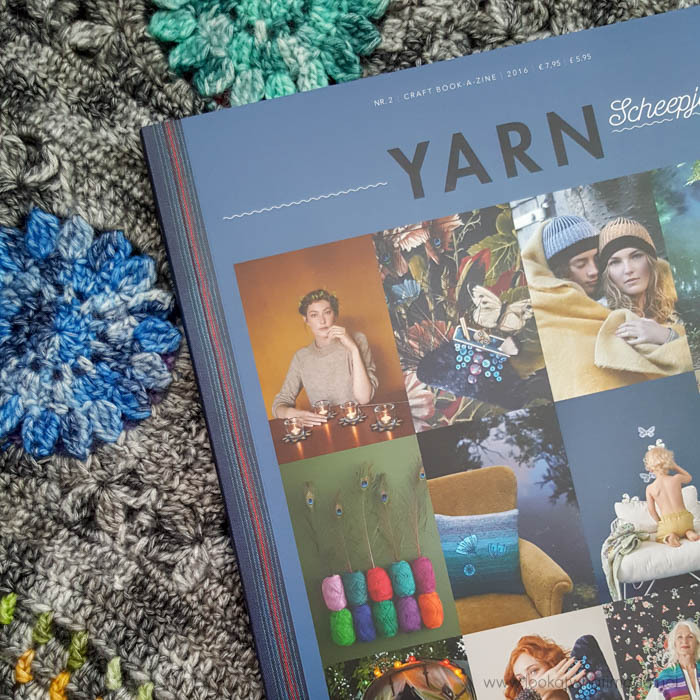 You can buy all three YARN Issues HERE on Wool Warehouse (along with all the Yarn: After Party pattern booklets). You can find your closest Scheepjes Stockists HERE. I hope that you find something in this bookazine that makes your creator-heart sing! When i say this i just bought the book and yarn. Simply love the simplicity and on other way it looks like a piece off art! Love love love. But i have also a small question did you block your single squares before attaching them? Hi Robin. I usually block my squares before joining, just to be sure that I am not making my joins too tight. It’s easier to adjust the joins to a looser tension if I can see exactly how big my squares are going to be once the finished blanket is blocked. I hope that helps. Hi Bo. All the yarn magazines contain patterns. They are gorgeously done and such a pleasure to own. 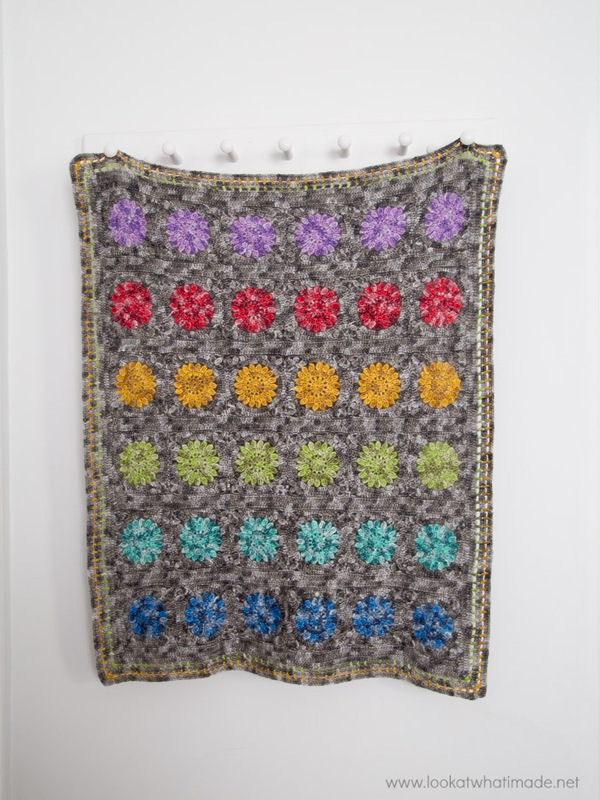 The pattern for this blanket is available in Yarn 2. Beautiful pattern and absolutely stunning colors. I’ve not heard of this yarn before, and will have to get some! Thank you for sharing. Thank you :) It is a lovely yarn to work with! Gorgeous colors, patterns and creativity. I love your work. I’d like to stay in touch and work on some of your patterns. Hi :) I wish more men would embrace the craft too! I would love to see a photo of the Milky Way in Australia (if you have one). The milky way here is not nearly as nice as in South Africa, and even then it never looked this colourful. Dedri, this is beautiful. Thank you for sharing all of the lovely photos. 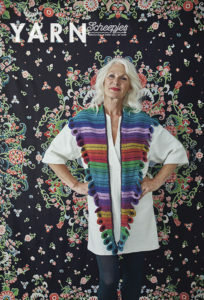 This is definitely inspiring me to keep on with the grannies I’ve been stitching. I can do a lapghan, right? Hope your sweet baby is feeling better real soon doll. Hugs from the USA! Love the colors and the star pattern. Beautiful work!